NEED A METAL FREE SMILE DENTIST IN PHOENIX? Now, at Peggy Myers and Associates, there is a new and economical way to restore teeth using tooth-colored resin fillings. The resin is made up of glass particles in a plastic matrix. Dr. Myers bonds the putty-like material to the tooth with a high-intensity light. This hardens the material and allows it to be shaped and polished for immediate use. Turn “Metal Mouth” into a natural smile. Replace old crowns and bridges with metal-free restorations. There’s a huge difference between metal fillings and Dr. Myers’ new porcelain restorations that reflect the translucence of natural teeth. Your new metal-free crowns, inlays and bridges won’t show wear or cause opposing teeth to erode. As you can see, tooth-colored fillings by Dr. Myers can substantially improve the beauty of your teeth. Once completed by Dr. Myers, your tooth has a natural appearance and is actually stronger than before due to the strength of the adhesive agent used to bond the resin to the tooth. Resin restorations not only look better, but they are stronger and last longer than the old silver-amalgam fillings. Many people in the Phoenix area have had silver fillings placed into their teeth because they had “cavities”. 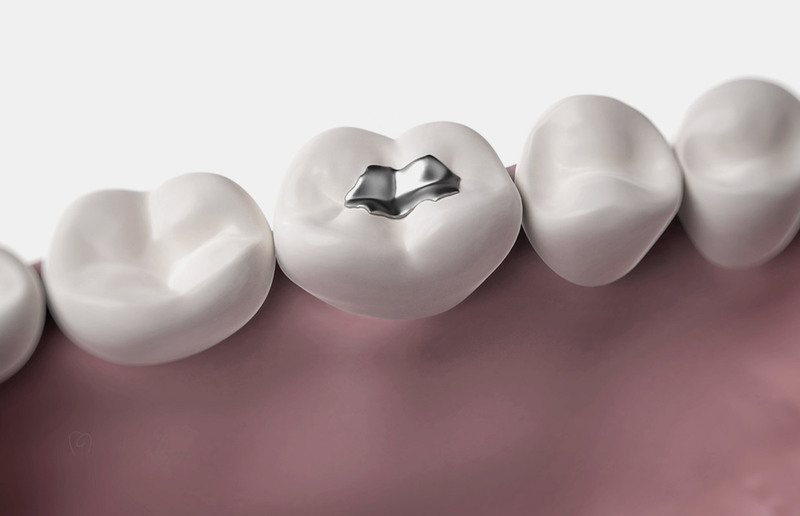 These silver fillings are called amalgams. Amalgam fills the space where the decay in the tooth has been removed. However, over time, the amalgam corrodes and leaks which blackens the silver, and many times the tooth. This is easily seen as soon as a patient opens his or her mouth and is usually a source of embarrassment for the patient. At Peggy Myers and Associates we can provide you with composite fillings that are made of a porcelain-like material that actually bonds to the tooth for a tight seal. They are strong and stain-resistant, and they are color-matched to the natural tooth, making them “invisible”. Composite fillings also lack the sensitivity that is often associated with silver amalgam fillings. They are especially suited for smaller cavities and for patients who may be allergic to metal fillings. Please don’t hesitate to call Peggy Myers and Associates with any questions you may have about the benefits of replacing silver amalgam fillings with invisible composite fillings.